A new name will soon grace the luxury real estate offering in Arizona that is bound to attract affluent international buyers from around the globe when FENDI Private Residences opens its first ground-up residential enclave in North America at The Palmeraie in Scottsdale. 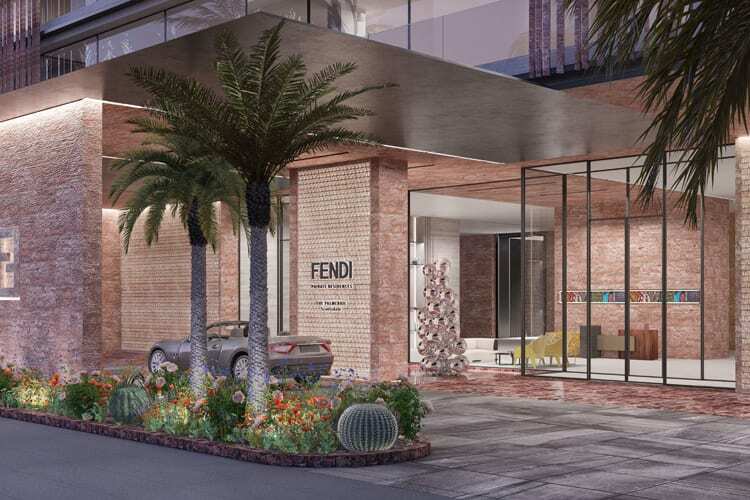 A boutique collection of 41 bespoke FENDI Private Residences will break ground later this year and each home will average 3,500 square feet with private access to an impressive amenity offering. FENDI Private Residences is an expression of FENDI as a complete lifestyle. The building will be designed and branded by FENDI. The architecture and design will be led by Marco Costanzi, the architect who has done FENDI Private Suites and FENDI’s headquarters in Rome. These residences will come-to-market later this year with delivery expected in 2020. “The world’s global leaders in fashion and culinary are taking notice of what we are creating here at The Palmeraie and Scottsdale’s emergence as a key, important strategic global destination,” said Jerry Ayoub, president and CEO of Five Star Development, the developer of The Palmeraie, a 122-acre, $2 billion luxury development. FENDI Private Residences is being formally announced tonight as The Palmeraie’s first official tenant during a VIP fête in Scottsdale at Hangar One, a private jet complex, with global retail and restaurant executives, influencers, media and tastemakers in attendance. A ceremonial groundbreaking event will follow the next morning to commence construction. The Palmeraie promises to be among the most interesting and desired experiential shopping and dining destinations in North America. The initial phase encompasses approximately 160,000 square feet of high-end, mixed-use space located on 18 acres at the strategic corner of Scottsdale Road and Indian Bend bordering the posh town of Paradise Valley. The Palmeraie is a magnet for consumers who are in search of the very best in shopping, hospitality, dining, luxury living, wellness and relaxation. Set in an open-air environment, The Palmeraie’s architecture and innovative landscaping evokes the senses – all set against the spectacular backdrop of Camelback Mountain and the Southwest’s iconic Sonoran Desert. An integral component of The Palmeraie’s revolutionary design is the extensive, intricate landscape. With its vibrant colors, diverse textures and architectural shapes, the lush landscaping at The Palmeraie is the yin to the modern architecture’s yang, enhancing the look, feel and sense of place. There will be an unexpected visual interplay of experiences sprinkled throughout the lushly planted “Green Walls”, vine-covered trellises and lavishly planted outdoor spaces such as the focal water gardens. Groves of flowering evergreen trees combined with soaring palm trees create a shaded, idyllic atmosphere. Where luxe meets lush, The Palmeraie forges a new oasis and aesthetic for Scottsdale. The project will be designed to create a series of indoor and outdoor spaces and vignettes blurring the lines between architecture, landscape and human interaction with a series of interconnected experiences linked together across the entire district. For more than three decades, Jerry Ayoub has been one of the industry’s most innovative and successful entrepreneurs. Ayoub’s projects range from five-star hospitality and luxury retail, to high-end, multimillion-dollar residential and Class-A industrial projects in Arizona, California and New Mexico. His record of success extends from the early days of his career in the luxury duty-free industry when he established operations on the U.S. borders with Mexico and Canada. Ayoub independently established and operated a half-dozen successful companies, including a duty-free business, which grew to become the largest duty-free operation in North America, along with a presence in Europe and Mexico. For additional information about The Palmeraie, visit The Palmeraie.com. To register for more information about FENDI Private Residences, visit FendiResidencesAZ.com.